When particularly contentious issues pop up in the current political environment, it’s not too long before the protests start. The so-called resistance seems to believe they are collectively changing minds by getting together and acting belligerent towards others, but reality suggests that they are having the complete opposite effect. Average Americans are tired of seeing people behaving like petulant children when they don’t get their way. This is true whether we are talking about famous faces that feel the need to comment on politics whenever a microphone is around, folks who apparently have enough free time on their hands to protest at the drop of a hat, or elected officials that feel it’s perfectly fine to act as if the ends justify absolutely abhorrent means. Despite the overwhelming evidence that the act is getting tired, the mainstream media completely obsesses over protests. We’re not just talking about covering them as newsworthy events either. The mainstream press wants viewers and readers to believe that the feelings of protesters are representative of feelings of everyone across the nation. This has been readily apparent throughout the entire Supreme Court confirmation process for Brett Kavanaugh. Protests that have looked to be suspiciously staged have rang out at various times, and the media takes the same tact each and every time. Many outlets have openly cheered on the protesters as if they have somehow changed or taken control of the conversation. That’s not reality. Minds are not being changed due to the protests. Those who may already agree with the protestors stance may feel a little more emboldened in their stance, but the same is true for the opposite side of the argument. And then some. As the mob mentality began to rule the day on the left, something rather fascinating happened. Rather than being intimidated by the bullying behavior, those who don’t agree with the leftist perspective on the situation found their own convictions strengthened even further. Nonetheless, the media continues to bypass this side of the story. On Saturday, it was quite clear that Kavanaugh was going to be confirmed, in spite of the best efforts of Democrats to completely bury him. 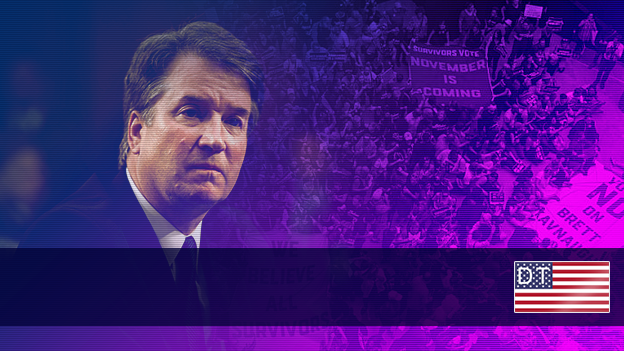 The GOP fought back, and they managed to win with a late round knockout after Kavanaugh was cleared by an FBI investigation that Democrats insisted on. A few protesters still made their way to the nation’s capital for unclear reasons, and the media was all over it as per usual. While various outlets attempted to present it as if the entire city was being overrun by those who were outraged by Kavanaugh’s confirmation, the reality once again did not line up with the story they were propagating. The president took to Twitter to clear up the confusion for the rest of America. “The crowd in front of the U.S. Supreme Court is tiny, looks like about 200 people (& most are onlookers) – that wouldn’t even fill the first couple of rows of our Kansas Rally, or any of our Rallies for that matter! The Fake News Media tries to make it look sooo big, & it’s not!” he shared on Twitter. It’s another black eye for the press, but it also serves as a fitting end to the entire Kavanaugh ordeal. Reality and what the press has to say are vastly different things on far too many occasions. Thankfully, more and more people are getting wise to that fact.